The SMMT has released UK car registration figures for April and for the year to date. 163,357 new cars were registered in the UK during April, a 14.8% increase on the same period as last year - the strongest growth in 14 months. 768,555 new cars were registered in the year to date, an 8.9% increase over the same period last year. The UK is massively outperforming European car registrations (relatively speaking) which is in a slump. UK private registrations are up a third, which is aiding the increase in overall figures. Reasons for the increase in private registrations are varied but the availability of cheap finance and relatively low prices and discounts are the major factors. The good news about the increase in private registrations is that the mix of petrol fuelled cars has increased, to 49.9% (383,763 units) of all registrations in the year to date, whereas diesel registrations account for 48.7% (374,495 units) of all registrations. Private registrations are at 49% (376,369) of market share and fleet registrations are at 46.6% (357,780 units) - the balance is in business and other registrations. There are no figures for the mix of petrol to diesel (or hybrid) amongst fleet and private registrations but the generally accepted view is that fleet sales have a much higher proportion of diesel registrations due to lower BIK figures whereas private registrations have a much higher petrol mix, because consumers favour petrol when given the choice and taxation is less of an issue. Amongst the manufacturers Ford has the most registrations so far in 2013 at 106,525, or 13.06% of the entire market. This represents a 2.95% increase over the same period last year. Vauxhall, Volkswagen, Audi and Nissan round out the top five manufacturers by volume with all of them seeing increases in sales. Saab, Proton, Lotus, MG and Maserati make up the bottom five manufacturers by volume. Maserati registered 104 cars in the year to date - a not unexpected figure given they are a low volume, high-priced, luxury manufacturer. 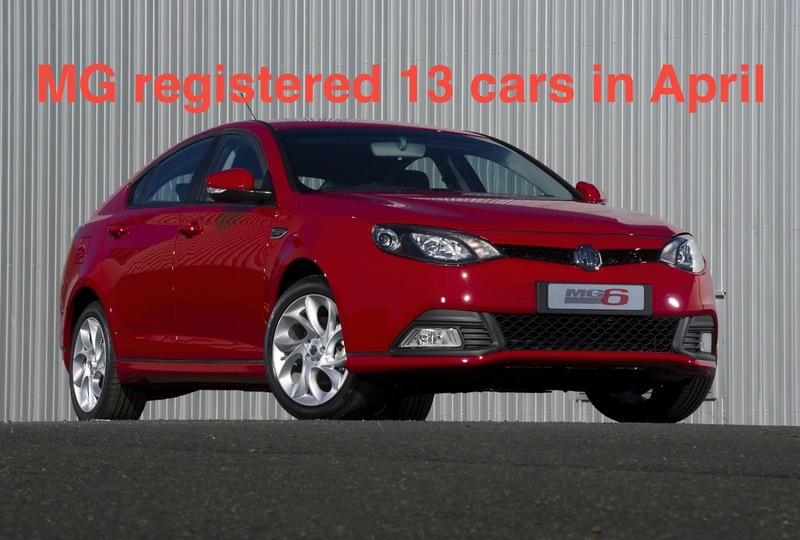 MG's miserly registrations of 94 this year is a massive shock given they registered 462 cars in the same period last year - they only registered 13 cars in all of April, and 2 of those are running around race tracks in the BTCC. Risers and fallers in terms of sales include Mitsubishi who have recorded 3931 registrations this year, a whopping increase of 54.89% over the same period last year, and Suzuki who have seen a 33.09% increase in registration to 11,637 units. Jaguar Land Rover have done well. Jaguar registered 6,058 units, a 25.05% increase, and Land Rover registered 22.248, a 20.63% increase over last year. At the other end of the scale, despite a huge marketing campaign and title sponsorship of the Red Bull F1 team, Infiniti recorded only 188 registrations, a 23.89% drop over last year. Other big name disappointments include Renault who registered 12,786 units - a 6.41% drop, Lexus who registered 2,770 - a 14.59% drop and Chevrolet who registered 4,124 - a 33.4% drop.